Recent releases of wolfSSL have included new assembly code targeted at the Intel x86_64 platform. Large performance gains have been made and are being discussed over six blog posts of which this is part 4. 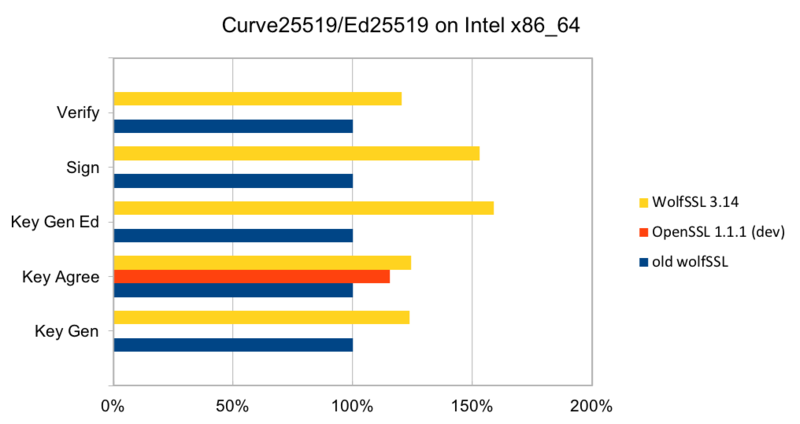 In this blog, we will talk about the performance of Curve25519 and Ed25519. Curve25519 is set of parameters for a Montgomery elliptic curve and has ~128-bit security. It is used in key exchange and has become popular due to its speed and inclusion in standards. The algorithm is included as part of TLS v1.3 and NIST is considering it as part of SP 800-186. Ed25519 is set of parameters for a Twisted Edwards curve and is mathematically related to Curve25519 and has the same security properties. A new signature scheme has been designed over Twisted Edwards curves that is fast and included as part of TLS v1.3. A draft specification has been written describing digital certificates using EdDSA with Ed25519. In a TLS handshake, a key exchange operation should always be performed to ensure forward-secrecy. When used, it will be a significant amount of the processing time during the handshake. 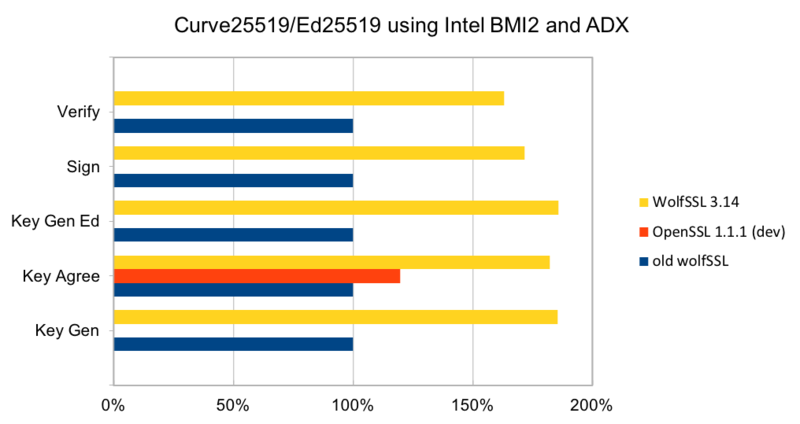 Improving the performance of Curve25519, therefore, increases the number of TLS connections that can be made per second. Older releases of wolfSSL have a C implementation of the algorithms. While the C code was quite fast, the new assembly code is significantly better. There is assembly code for generic Intel x86_64 CPUs, and for CPUs with BMI2 and ADX (Broadwell and newer CPUs). The two charts below show the relative performance of wolfSSL and OpenSSL compared to the C implementation on Ivy Bridge and Skylake CPUs. On the Ivy Bridge CPU, the new assembly code is between 20% and 60% better than the C code and is better than OpenSSL in the one operation that can be measured. On the Skylake CPU, the assembly code is between 60% and 86% faster. The OpenSSL code has not been optimized for this CPU and is significantly slower. Contact us at support@wolfssl.com with questions about the performance of the wolfSSL embedded TLS library.